Press Releases & Public Statements | Why Not Manston? “This means that Manston has been accepted as a site of nationally important infrastructure. That is what those of us who have recognised the post-Brexit strategic value of Manston have been saying for some time: we are desperately short of runway capacity in the South East and Manston offers a literally unique opportunity to provide freight and passenger capacity. I would like to immediately pay tribute to those, the RiverOak Strategic Partnership, the new administration of Thanet Council and those overwhelming numbers of local people who have, in the teeth of ridicule and vilification, held to the long-term vision for Manston Airport and recognised the national rather than the short-term commercial interest in using this essential national asset for its proper purpose. The consortium aiming to re-open Manston as a cargo airport has resumed its attempt to acquire the site. RiverOak Strategic Partners has submitted a fresh application to force the current owners to relinquish the site through what is known as a Development Consent Order. The consortium withdrew its original application in early May after the Planning Inspectorate raised a number of questions around details of the bid. The current owners are proposing the site be used for a mixed development of 4,000 houses and business use. The news of a renewed DCO comes ahead of a critical meeting on Thursday when councillors will vote on Thanet’s draft Local Plan – its future blueprint for where houses will be built. That plan includes a proposal to continue to earmark the site for some kind of aviation use. Thanet Conservative county councillor Paul Messenger first revealed the news that there was to be a second application at a full council meeting. And he revealed there was the possibility the company – RiverOak Strategic Partners – could offer part of the site for holding lorries during Operation Stack. In remarks that pre-empted any official announcement from the company, Cllr Messenger said Manston would help build the county’s resilience in the event that Brexit threatened to cause gridlock. He said: “I am pleased to announce that RiverOak will be submitting its DCO ‘mark two’ this week. “Manston will provide resilience for freight through Kent because there is evidence that a vast quantity of freight is trucked to and from northern European airports to the UK increasing the costs for all those in the supply chain. RiverOak Strategic Partners want to reopen Manston airport. He went on to say that RiverOak wanted to discuss with KCC and other agencies the idea of using the site for lorry freight. “A new Manston cargo airport would help reduce “ro-ro” freight through Kent and the channel ports. Meanwhile notes of a meeting between officials from the Planning Inspectorate and RiverOak about the DCO have been published. The notes indicate the Planning Inspectorate has received various assurances about details of its plan. However, the notes also suggest it again raised concerns regarding the funding of the project. The notes say “advice from the previous meeting was reiterated in terms of providing evidence-based assurance that adequate funds would be available to enable Compulsory Acquisition (CA) of land and rights within the relevant time period“. George Yerrall, a director of RiverOak Strategic Partners (RSP), said: “The original DCO application, which was submitted in early April, and which ran to 11,000 pages, was the culmination of 27 months of intensive work on the part of the RSP team and our professional consultants. “This included three separate consultation exercises as well as a complex planning appeal. “We were therefore naturally disappointed to be informed by the Planning Inspectorate that, in their view, the application fell short in certain respects. “Nevertheless, we have taken up all the points raised by the Planning Inspectorate and, working with our full team, we have used the past nine weeks to provide full and comprehensive responses to those points. “We have also taken the opportunity to clarify the situation in relation to the two museums. “A new operational runway at Heathrow is still a number of years away” and that “there will also be a need for other airports to make best use of existing runways”. “In welcoming the Secretary of State`s announcement (about the proposed third runway at Heathrow) and without wishing to compromise him in any future decisions that he may find himself required to make I note that he has said that it will be some years before there are wheels on new tarmac at Heathrow. 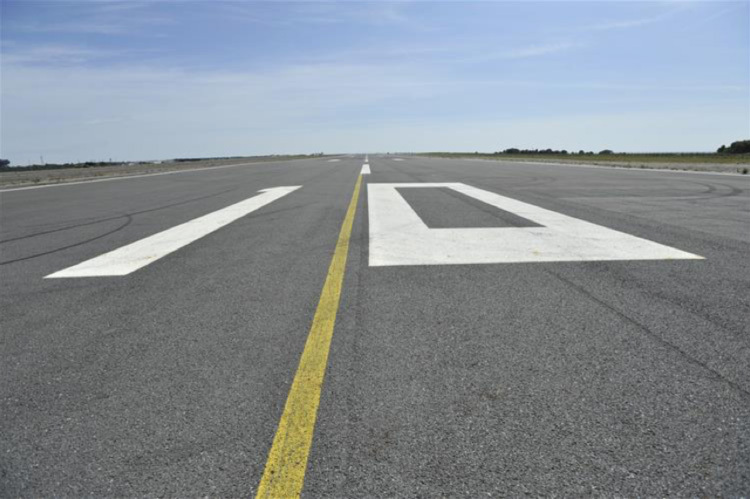 In the light of Brexit and the need to `make best use of existing runways` may I ask that the Government looks favourably upon proposals to restore existing runway capacity and freight and passenger handling facilities at airports in Kent”? “I shall look forward to seeing any proposals that my Honourable Friend brings forward”. “The Secretary of State clearly cannot comment on a proposed development Consent Order for Manston but his unprompted statement that “we need to make the best use of existing runways” while awaiting development at Heathrow chimes exactly with what I have been saying: we cannot wait for fifteen or even an optimistic ten years for a third runway to be built at Heathrow: we need additional capacity immediately and to serve the air freight and passengers demands of a post-Brexit Britain. Manston Airport is a national asset and one that we cannot afford to discard. I trust that when the development Consent Order is re-submitted it will receive favourable consideration so that we can get on with the real task of getting Manston Airport up and running and serving Britain in the future as it has done in the past”. “I am not aware of any commitment by Homes England to the re-development of Manston Airport for housing and I regard the suggestion, which I note contains no supporting comment from Homes England, as speculative and disingenuous. Manston is zoned in the Local Plan as an airport, a fact that was underscored by the Planning Inspectorate when it rejected SHP`s earlier applications. There is no planning consent for Manston for housing or general industrial use and to suggest that Homes England, a Government-sponsored body, would engage in any commitment to any site without appropriate consents would be improper. I regard this claim as another exercise in SHP kite-flying. RiverOak Strategic Partners has today dispatched 63 documents, containing almost 11,000 detailed pages of proposals and plans to re-open Manston Airport as an air freight hub with complementary passenger and general aviation services, to the Planning Inspectorate in Bristol. The Development Consent Order application includes a full Environmental Statement, a four-volume Economic Assessment, detailed plans and drawings of all aspects of the proposals and a full report on the one non-statutory and two statutory consultation exercises, undertaken across 2016, 2017 and 2018, to which over 4200 responses were received. Copies of the DCO application were dispatched by courier for hand delivery to the Planning Inspectorate in Bristol, marking the start of the ‘Acceptance’ stage of the DCO process. There will now follow a period of up to 28 days for the Planning Inspectorate, on behalf of the Secretary of State, to decide whether or not the application meets the standards required to be accepted for examination. This is the first airport DCO application to have been made under the Planning Act 2008. George Yerrall, Director of RiverOak Strategic Partners, said: “This is a hugely important moment for us, but I also recognise that it is a significant moment for many people across Thanet and East Kent too. On behalf of all of the directors of RSP I would like to thank the entire team who have worked incredibly hard, over several years, to get us to this point – and also extend my thanks and appreciation to all those in the community that have supported us on this journey. Thanet has an excess of land available to meet the projected demand for housing without recourse to the use of Manston airport. When I stated that fact some weeks ago I was challenged by the Leader of the Council, Cllr. Wells, to “put up or shut up”. my assessment has now been confirmed by a report prepared by the independent planning consultancy RPS group. In their findings, published last week, the consultants show clearly that without building houses on Manston Airport well in excess of 100% of the space required to meet Government targets to 2031 has been identified and it is arguable that not only is Manston not required but that some of the Grade One agricultural land that the present administration has included in the draft Local Plan should not be prioritised either. It is also the case that even if the changes to calculations proposed by the DCLG, and quoted by Cllr Wells and officers as a ‘ frightener’ should Thanet Council reject the draft local plan, were to be imposed then a new figure of 21,260 houses, however unlikely they are to actually be built, could readily be achieved without including Manston Airport in the land bank. The 2015 Thanet Draft Local Plan states that “it is considered that a successful airport has the potential to be a significant catalyst for economic growth” and adds that the principle purpose of the Manston Airport Area Action Plan ” should be the retention, development and expansion of the airport and aviation operations”. That Draft went out to consultation and gained wide public support. Cllr. Wells’ administration now seeks to change the current designation as an airport and for aviation uses to a new mixed- use development combining, by 2031, a minimum of 2,500 dwellings in addition to those already identified and provided for, together with other commercial development. That proposal is not supported by an adequate environmental impact assessment and makes no provision for vital infrastructure including not least water supply. I hold to the view that post- Brexit it is vital that we retain and develop Manston as an airport in the National and in the local interest. Once lost, it can never be replaced. Unless, therefore, the Council is prepared to withdraw its’ change of use proposals for Manston, which can be done swiftly and without further consultation, then elected Councillors should ignore the dire warnings of Cllr. Wells and officers and reject the current draft local plan. Given the political will there is still time to revise and adopt a realistic plan before the end-of-March deadline and I do not believe that the Secretary of State is likely to take precipitate action to seek to penalise Thanet for the preservation of the unique national asset that is Manston Airport. Even if you have responded before to previous consultations it is imperative that you submit a new response once the consultation goes live because at this stage the submissions go directly to the Secretary of State who will look at the responses with fresh and independent eyes. The decision of the Public Inquiry regarding Lothian Shelf ‘s (718) appeal to allow the re-designation of buildings on Manston Airport has been released with the Inspector, Mr Nunn, dismissing all 4 appeals. “Overall, I conclude that the appeal schemes would conflict with Policy EC4 of the Local Plan, as well as its wider economic development and regeneration objectives. The proposals would conflict with the Council’s current approach to the location of new development within the airport, which is consistent with national policy. The benefits of the scheme put forward by the appellants do not justify departure from Policy EC4 of the Local Plan. Hence I find there are no material considerations of sufficient weight that would warrant a decision Appeal Decisions APP/Z2260/W/15/3140990, 3140992, 3140994 & 314099512 other than in accordance with the development plan. Originally, the owners of Manston, Stone Hill Park applied for the change of use of four existing buildings from aviation use only. The Planning Committee of Thanet District Council rejected the original application, but failed to respond in time on the other applications. They did however later resolve that they would have made the same decisions on the other cases. RiverOak is proposing to reopen Manston Airport as a vibrant air freight hub with associated business aviation and passenger services, creating almost 30,000 jobs by the airport’s 20th year of operation. It is currently consulting on these proposals before submitting an application for a Development Consent Order to the Planning Inspectorate. The consultation runs from Monday 12 June 2017 to Sunday 23 July 2017. Seven public consultation events will be held between Wednesday 14 June and Saturday 24 June, as part of a six-week consultation period on RiverOak Strategic Partners’ proposals to reopen Manston Airport as an air freight hub, creating thousands of jobs for Thanet and the wider regional economy. George Yerrall, Director of RiverOak Strategic Partners, said: “The consultation is very important to us as it allows the local community to scrutinise our proposals and share their views and thoughts with us. This, in turn, will enable us to refine our proposals further before submitting the Development Consent Order application to the Planning Inspectorate, later this year. Copies of consultation documents will be available from 12 June at www.rsp.co.uk and at these public libraries during their normal opening hours: Birchington, Broadstairs, Cliftonville, Deal, Herne Bay, Margate, Minster-in-Thanet, Newington, Ramsgate, Sandwich and Westgate. As the full Preliminary Environmental Impact Report (PEIR) is a very large document, it will only be available in full at Deal, Herne Bay and Margate libraries. A non-technical summary will be available at all libraries, at the seven consultation events and on the RSP website, as part of an Overview Report. In addition to the public events there will be two business-only briefings, at The King’s Hall in Herne Bay, on Wednesday 14 and at the Pavilion in Broadstairs, on Thursday 15 June. Businesses interested in attending should email manston@communityrelations.co. uk for further information and to secure a place. The full consultation period will run from Monday 12 June 2017 to Sunday 23 July 2017. After initially expecting to issue a decision no later than Friday 26th May 2017, the Planning Inspectorate has decided to delay the decision until after the results of the General Election are known. The Planning Inspectorate always aims to issue decisions promptly after the event. However, in the run up to the General Election, we are always concerned to ensure that proposals which have raised particular sensitivities or interest cannot be deemed to have influenced the election or to have been used to electoral advantage by any interested body. Accordingly, given that the appeals at Manston Airport have given rise to considerable interest and controversy, the Inspector’s Decision will be held back until after the results of the general election on 8 June 2017 are known. Further details regarding the pre-election period are given on the PINS homepages on the GOV website. *KNMA is a Kent University Action Group that wishes to align with the existing and established three groups dedicated to the re-emergence of Manston Airport. The consultation is an opportunity for members of the public to scrutinise our proposals and suggest any changes to them. RiverOak Strategic Partners is also keen to hear any ideas about how to maximise the benefits to the region from reopening Manston Airport. Gale’s View – Sir Roger Gale M.P. The two meetings held at the weekend, at Margate Winter Gardens on Saturday and at the Manston Sports and Social Club on Sunday, should have sent a very clear message to the Leader of Thanet District Council (who attended for part of Saturday’s meeting), to those at present in control of Manston Airport and to what at present passes for “leadership” at County Hall. Contrary to the suggestion made recently that Thanet’s second Draft Local Plan, which seeks to zone Manston for housing and industrial use, has “killed off hope” of re- opening Manston as a commercial airfield progress towards the necessary Development Consent Order is moving inexorably forward. The decision by the Planning Inspectorate to dismiss the feeble objections raised on behalf of Messrs Cartner and Musgrave leading to a Ministerial decision to grant RiverOak access to the site to carry out the necessary Environmental Impact Assessment (EIA) denote a recognition that the project to re- open Manston is, as I have consistently said, of National significance. For the sake of UK limited, as well as for the prosperity of East Kent, I urge all of those in the area who support this cause to both write in objection to Thanet’s Local Plan proposals for the airport and to respond to a Kent County Council consultation on the proposed Thanet Parkway station from which County Hall has noticeably airbrushed out Manston Airport while concentrating on a ‘ Stone Hill Park’ that does not exist on any map known to man. It is the future of our children and our grandchildren that is at stake. Carol Vorderman has joined an all party Parliamentary group (APPG) which yesterday launched a fight for the £3bn General Aviation sector that creates jobs & inspires young people to participate in STEM. The group includes Grant Shapps and Sir Roger Gale. “The campaign to save Manston Airport rolled into the House of Commons this week following the launch of an all-party group for general aviation. Thanet North MP Sir Roger Gale renewed his vow to fight to see Manston re-opened and aircraft once again landing and taking off at the historic airfield, describing it as an “act of corporate vandalism” on the same week that Thanet District Council opens its consultation into amendments to its local plan, where it proposes the site will be turned over for mixed-use, rather than just aviation. 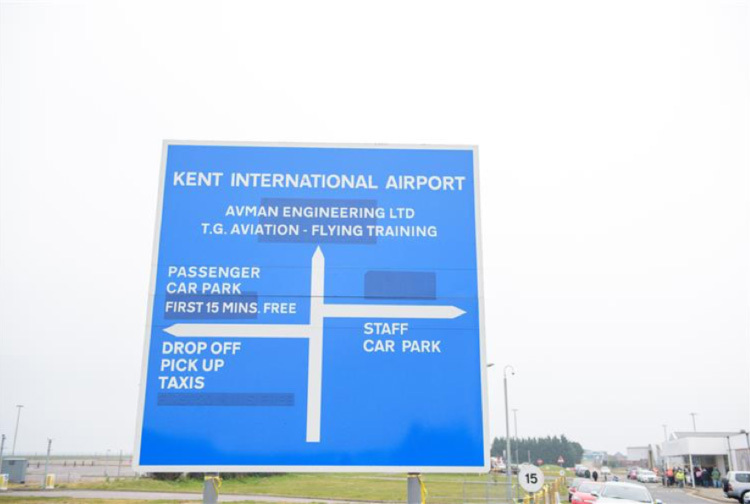 A report by consultants Avia Solutions last year concluded that airport operations at Manston were “very unlikely to be financially viable”. Sir Roger was joined at the launch by television personality Carol Vorderman, who owns and flies her own light aircraft and has previously done so from Manston. At the meeting, the former Countdown star stressed the importance of the contribution made by the Air Cadets, for whom she is an ambassador, to the training of tomorrow’s young pilots and engineers and of the country’s airfields to the future of jobs and prosperity both now and post-Brexit. Sir Roger himself paid tribute to the late Ted Girdler, the former Red Arrows pilot and founder of TG Aviation, and for his family’s work in running a flying club and promoting general aviation. He also called upon the group to press for legislation to protect airfields from changes in planning use, saying that “once these national assets are gone they are lost forever”. The group has been formed under the chairmanship of the MP Byron Davies to promote the interests of general aviation and to protect further airfields from closure and re-development as “brownfield sites”. Mr Davies said: “General aviation is worth over £3 billion to the UK annually, provides unrivalled training to our pilots and supports a huge industry of enthusiastic aviators. “Aviation has a long and proud tradition in the UK and supports thousands of jobs in constituencies across the country yet it faces a crisis that must be averted. RiverOak have produced a document, dated September 2016, entitled ‘MANSTON AIRPORT – AVIATION ACADEMY’, in response to the Thames Estuary 2050 Growth Commission. In it, they talk about their vision to create a Manston Aviation Academy should their application for a DCO be successful. 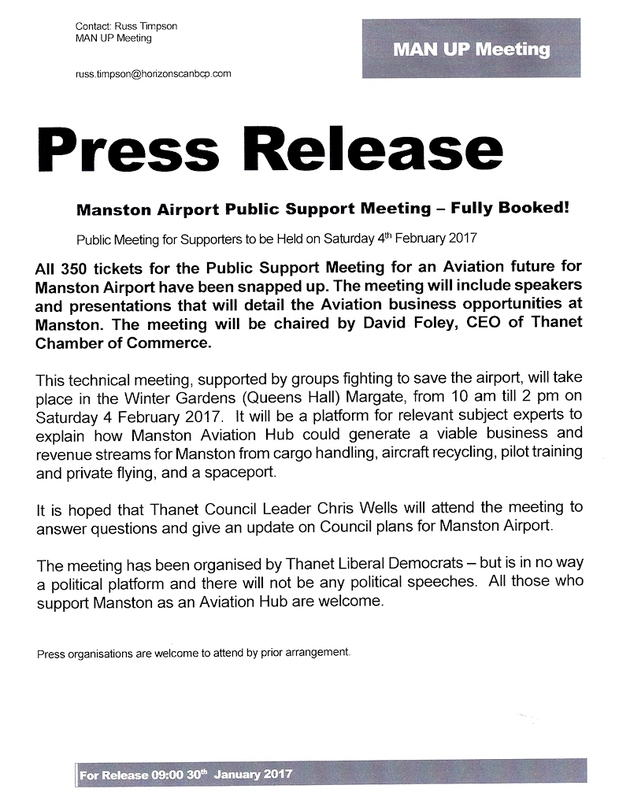 Manston Airport Public Support Meeting – Gate Closing! Tickets for the Public Support meeting for an Aviation future for Manston have been very popular. There are just twenty tickets left for anyone who wishes to attend and show their support. An excellent line up of speakers will detail the business opportunities at Manston as an Aviation hub. The meeting will be chaired by David Foley, CEO of Thanet Chamber of Commerce. This technical meeting, supported by groups fighting to save the airport, will take place in the Winter Gardens (Queens Hall) Margate, from 10 am till 2 pm on Saturday 4 February 2017. It will be a platform for relevant subject experts to explain how Manston Aviation Hub could generate a viable business and revenue streams for Manston from cargo handling, aircraft recycling, pilot training and private flying, and a spaceport. 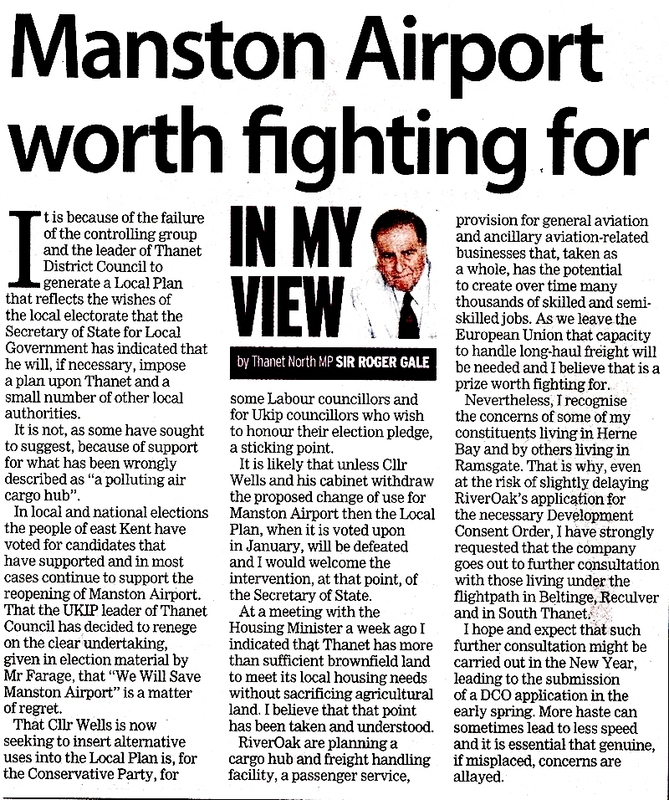 Overall it will amount to a clear statement of the case for accepting that Manston can be a sustainable, viable aviation services hub, bringing employment and innovation to Thanet for many years, and making full use of a valuable existing asset. The meeting has been organised by Thanet Liberal Democrats – but is in no way a political platform and there will not be any political speeches. All those who support Manston as an Aviation Hub are welcome. 1. Please see final amended press release attached – only use this version for wider circulation. Grateful if you could circulate and advertise on your websites, etc. 6. We should send all those who attend away with a clear set of ‘Things to do’, i.e. write a letter, etc. – have you got any ideas for what should be on the list? 8. Any thoughts or suggestions to help make the meeting successful? We have had word from the Case Manager, that the Public Inquiry into the Change of Use of four Manston buildings has been postponed yet again. “I am sorry for the nature of this email but wanted to you all know as soon as possible that the Inquiry, currently scheduled to open on 24th January 2017, has been postponed. Following the change in stance of the Local Authority whereby it has withdrawn its objections to the proposals, RiverOak, with ‘Rule 6’ status, is now the only main party opposing the proposals. Although reluctant to postpone the Inquiry yet again, the Inspector is keen to ensure that the Rule 6 Party, and any other objectors, are not prejudiced, particularly now that the Council has withdrawn all its objections. On this basis he has agreed to a postponement of the Inquiry. The principal parties have been advised to liaise and agree a further date, or dates, for a reconvened Inquiry in February 2017. Once this has been agreed, the LPA will notify everyone again. Please can you let anyone know who intended to attend the Inquiry that it was now been postponed and will not be occurring as planned? “MANSTON AIRPORT HAS A VIABLE FUTURE – MAN UP! Thanet District Council is launching a public consultation on its draft Local Plan, in which the current Manston Airport site is to be turned over to mixed use, particularly housing. On 4 February we plan to show that the airport does have a viable future as an aviation centre, not just as an airport but by combining various forward-looking and ambitious activities. This technical meeting, supported by the main groups fighting to save the airport, will take place in the Winter Gardens (Queens Hall) Margate, from 10 am till 2 pm on Saturday 4 February 2017. It will be a platform for relevant subject experts to explain how Manston Aviation Hub could generate a viable business and revenue streams for Manston from cargo handling, aircraft recycling, pilot training and private flying, and a spaceport. 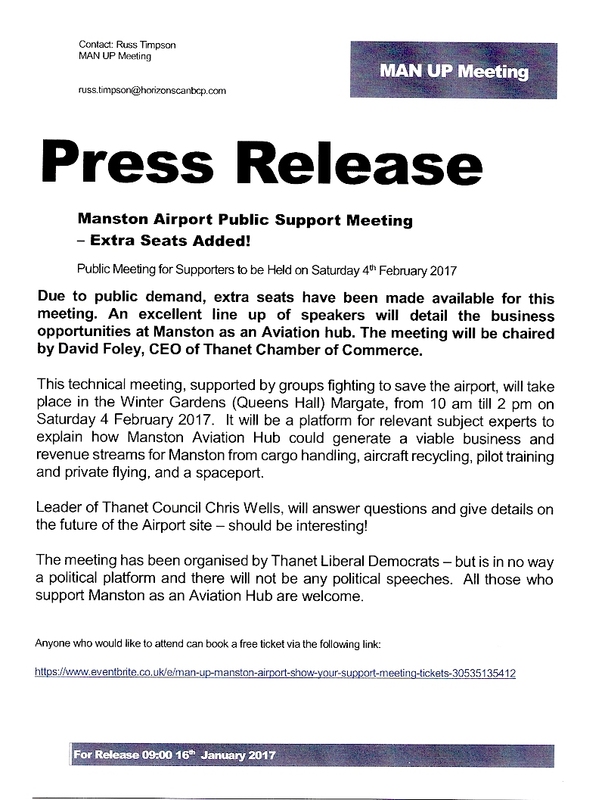 The meeting has been organised by Thanet Liberal Democrats – all those who support Manston as an Airport regardless of political party affiliation are welcome. Secretary of State Grants Access to Airport – MP’s Comments. North Thanet`s MP, Sir Roger Gale, has welcomed the confirmation, now formally issued by RiverOak (See below) that the Secretary of State has accepted an application, recommended by the Planning Inspectorate, by RiverOak for access to Manston Airport to complete environmental survey work prior to the Company’s submission of a Development Consent Order. It is significant that the Planning Inspectorate and the Secretary of State have accepted the arguments put forward by RiverOak and has rejected the arguments put forward by those currently in control of the site and who have consistently sought to deny access. The Secretary of State has, through this decision, recognized RiverOak as a player in the future of Manston and has also acknowledged the importance and significance of the campaign to retain Manston as an operational airfield. The decision was, of course, also taken in the knowledge of the existence of the now widely-discredited Avia Solution report upon which Cllr. Wells and his councilors have sought to hang their volte-face upon the future of Manston. There is still a great deal of work still to be done before a DCO submission is made and that submission, which will contain not only the Environmental Impact Assessment but a full Business Case, will then have to be the subject of a public inquiry, Inspectors` report and ultimately a decision by the Secretary of State for transport. Nevertheless, I am comfortable that this administration, as did David Cameron`s, understands the importance of preserving structural assets in the national interest. It is time, I think, that those at present in control of the site and of Thanet District Council took that on board. On Monday 19 December the Planning Inspectorate confirmed to Bircham Dyson Bell, lawyers for RiverOak, that Section 53 authorisation (permission to access the Manston Airport site), has now been granted. Whilst a considerable amount of environmental analysis has already been completed, access to the site has always been preferable to provide the necessary level of detail for a Development Consent Order application. RiverOak’s environmental consulting team, led by Amec Foster Wheeler, will now make arrangements to visit the site as soon as possible in order to assess the site for the production of the Environmental Statement that will accompany the application. As much data as possible will also be used for the Preliminary Environmental Information Report. This report, together with other work already well underway, will be made available during the process of statutory consultation, which will take place as soon as possible in 2017. At the TDC Planning Meeting last night, 14th December, the Planning Committee passed a motion to withdraw their objections to the change of use of four buildings on Manston Airport, subject to the imposition of appropriate safeguarding conditions. Following Barrister advice, UKIP and Labour accepted the Officers recommendation in a recorded vote and removed the long standing objection to the change of use. The item on the agenda had been subject to much criticism before the meeting because Barristers had advised that the matter be heard behind closed doors. However, during the meeting Monitoring Officer Tim Howes gave three options. 1. To hear the whole item behind closed doors. 3. To hear the whole item in full session. Mr Howes recommended Option 2. Opposition Leader Bob Bayford agreed with the second option, as did Cllr Ash Ashbee. Cllr Gregory and Partington argued that they could not see why any of the discussion should be behind closed doors. Members then voted in favour of Option 2. The Public were then able to hear the Planning Officers recommendation and witness the subsequent recorded vote but they were not allowed to be present to hear the Barrister’s advice. The motion was subsequently carried. We asked Councillors for their comments. “The UKIP committee members voted to follow officer and barrister advice, as to vote in any other way would have been considered an unreasonable decision which would in all likelihood have resulted in reputational and financial damage to the Council. Also the credibility of the planning committee could have been brought into question. As we understand it, a clause in the motion ensures that if, when, a sound business plan comes in for the airport it will supercede all previous decisions, including those on the four buildings. Source: FT on 1st Nov16. So, the inference is remarkably simple. No mainstream politician or businessperson doubts the central role of aviation in connecting large, modern nations with the rest of the world economically, culturally and socially. You only have to look at national planning around the EU and beyond to see that. Thus, in order to keep up in the shrinking global economy, especially in a post-Brexit environment, we’ve got to protect our aeronautical assets against the obvious attractions of a change of use.